What happens when you put an antenna in the attic? Because I get it, no one wants to go up on the roof. Roofs are slanty and slippery and they can get snow and leaves and other stuff and there’s always that fear of putting your foot through them or stepping on a loose nail. In contrast, while some attics are dark and scary places, others are relatively benign and seem like good places to put an antenna. If you do want to put your antenna in the attic, there are a few things you should know. It won’t work as well. That’s right, you’re going to lose about half the receiving ability of that antenna, maybe more. Blame the roofing material and the walls. If the roofing material has a lot of iron in it (like Spanish tile) it’s going to be murder on television signals. Same with your outside paint. You picked a color that looked good to you but you didn’t know that some colors of paint have chromium, cobalt, copper, and other metals in them. No one tells you that stuff when you pick paint. Those metals will just bounce signals back instead of letting them through. It still needs to be aimed right. You’re still going to do all the things you would do outside, like mounting the antenna properly and aiming it. You really should get it up off the floor as high as possible but if you have a steeply pitched roof that may make it harder to point it in the right direction. Dust never sleeps, and it can be a problem. When it rains, your outdoor antenna gets a little bath that keeps the worst stuff off it. 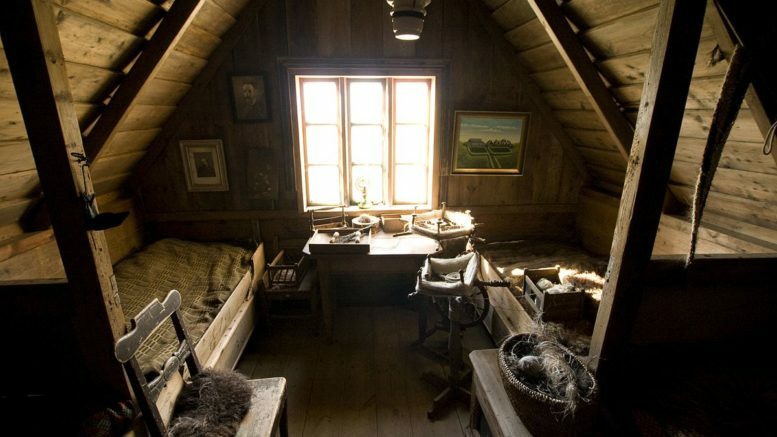 Inside the attic, it can get dusty and dirty. That shouldn’t really be too much of a problem but… it can be. I know of one person who lives in an area where the soil has a lot of red clay. (Red clay is mostly iron.) That means the dust in the air has a lot of red clay too. Dusting the antenna helped him get a few more channels, so obviously there was something making reception harder. You know, people go up there. No one goes up on your roof except birds. On the other hand, there are plenty of reasons to go up into the attic, since it’s not as scary as the roof. So there’s also a possibility of people bumping into an antenna, moving it, breaking it, what have you. The thing is, I’m not against putting an antenna in the attic if you have no choice for whatever reason. But, you’ll really get a much better return on your antenna investment by mounting it on the roof. There are options if you don’t want to drill holes. You can mount to a chimney or use a non-penetrating mount. You can mount to an eave or a gable, too. It’s up to you. And yes I know that means getting up on a ladder and all that stuff that your spouse or partner will tell you will get you killed. And folks, I don’t advocate you dying or injuring yourself just to get free TV. It’s not worth it. But on the other hand if you’re planning to undertake a project like this, you might just want to find a way to get up to the roof safely. After all, you’re putting up an antenna to get as many channels as possible, right? Your first step, of course, is to shop the great selection of mounting supplies we have at SolidSignal.com. Your Indoor/Outdoor TV Antenna Solution!